Writing Programs at ASU is one of the largest writing programs. As such, we are always looking for enthusiastic writing teachers who can contribute to our ongoing effort to provide quality writing instruction to our students. I addition to classroom teaching, there are many opportunities for professional development--workshops, lectures and conferences. Many writing teachers also gain valuable professional experience by participating actively in curriculum development, mentoring, and conference organization. Instructors in Composition and Rhetoric -- Required: MA in Rhetoric and Composition or in a related field; post-secondary teaching experience in composition. Applicants who are not native English speakers must provide evidence of having received a minimum score of 55 on either the SPEAK test or the TSE. Desired: Evidence of graduate coursework in Rhetoric and Composition if degree in related field; Ph.D. in Rhetoric and Composition or related field; evidence of effective teaching; evidence of attendance/presentations at Rhetoric/Composition professional conferences. Send materials to Search Committee, (Instructor, Rhet/Comp), attn. D. Baker, English Department, Writing Programs, Box 870302, Arizona State University, Tempe, AZ 85287-0302. Instructors in rhetoric and composition with an emphasis in professional writing -- Required: MA in Rhetoric and Composition or in a related field; graduate-level coursework in business, professional and/or technical writing; post-secondary teaching experience in composition or business / professional / technical writing. Applicants who are not native English speakers must provide evidence of having received a minimum score of 55 on either the SPEAK test or the TSE. Desired: Evidence of graduate coursework in Rhetoric and Composition if degree in related field; Ph.D. in Rhetoric and Composition or related field; evidence of effective teaching; evidence of attendance/presentations at Rhetoric/Composition professional conferences. Send materials to Search Committee, (Instructor, Professional Writing), attn. D. Baker, English Department, Writing Programs, Box 870302, Arizona State University, Tempe, AZ 85287-0302. CCCC Committee on Diversity will be featuring a series of guest bloggers on the CCCC blog who will address issues of diversity from various perspectives. The first featured blog is by Victor Villanueva. 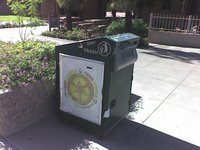 Then, recently, these green boxes began to appear in various corners. I've always thought they were recycling bins sponsored by Pepsi because of the white posters on both sides. But if you look closely, they are actually high tech decomposting trash cans powered by solar cells! Whoever designed these needs to take our English 301 (technical writing). Collaborative Approaches to Research in English Studies"
multiple campuses or even from beyond the academy. beyond the academy, and how it can and should be disseminated. be woven throughout the chapters. the study of digital tools, texts, use practices, and culture? * How does research happen within teams or work groups? * In what physical or virtual spaces does this work take place? * What resources are essential? * What are the outcomes or deliverables of collaborative research? * Who are the audiences, clients, or beneficiaries of this research? disseminated (e.g., blogs, Web sites, wikis, multimedia)? As the deadline draws near (this Monday, June 2nd, 11:59 p.m. EST), I urge you to put the finishing touches on your TESOL proposals and to submit them under the Second Language Writing Interest Section. Very simply, each interest section is represented proportionally--if SLW-IS proposals represent 20% of all TESOL proposals received, then we are assigned 20% of the adjudicated program slots. If you have more than one brilliant idea, submit them all! You can only be the primary presenter on one of the accepted proposals, but the reviewers will select the one that will be of greatest interest and value to a balanced program. Please, give us plenty to choose from! Also, please note that Discussion Groups are adjudicated this year, so even if you've got more questions than answers and would like to hear others' ideas, propose a discussion group this year. Listed below are the topics brainstormed at this year's planning meeting--quite a varied list. Please know that your colleagues are interested in what you're doing and eager to learn from you. All of us together are making the SLW-IS the vibrant, rapidly growing interest section that it is. Thank you for your participation and your proposals! What happens after ESL classes when students enter mainstream (thinking, pattering, prep in EAP)? Here is my advice to people who are thinking about applying to the Master’s Program in TESOL at ASU. The information provided here is my personal opinion and does not necessarily reflect the views of other MTESOL faculty members, the Department or ASU. Why do you wish to pursue a master’s degree in TESOL? To begin your career as an English language teacher? To become a more effective teacher in your current teaching context? To expose yourself to the most up-to-date ideas about the English language, language learning, and language teaching? To gain the credential to teach in intensive language programs or college-level ESL courses? To prepare yourself for a research career in TESOL (by continuing onto a Ph.D. program)? What experience have you had in the field of TESOL? Have you taken a course? Have you taught English? Have you reflected on your own language learning experience? It’s OK not to have any experience at all—everyone has to start somewhere, and Master’s Program in TESOL provides an excellent starting point. What do you hope to learn through your studies? Although Master’s Program in TESOL is a general preparation for professionals in TESOL, it helps to have a sense of what you hope to learn in the program, which helps you determine the best plan of study and identify appropriate faculty mentors. Why are you interested in this particular program? It is the wide variety of courses that are offered by the program? Is it the opportunity to gain teaching experience through the internship program? Is it the reputation of the faculty members or graduates of the program? Did a graduate of this program recommend it to you? If so, what did they say that made you want to apply to this program? Do you have a faculty member whose work you are interested? If so, you can mention the person as one of the reasons for applying to this particular program—it shows that you’ve done your homework. But don’t just drop names—listing everyone is not as effective as mentioning one or two people and explaining how their work has inspired you and relates to your professional development and career objectives. What do you plan to do when you complete the program? Do you plan to teach in the United States or abroad? Do you plan to continue onto a Ph.D. program in TESOL or a related field? Are you thinking about starting a language school of your own? A graduate degree is always a means to an end. Have a clear idea about where you are headed. It’s OK to change your mind after you enter the program—you will be introduced to the whole world of TESOL during your studies, and you may discover new possibilities you’ve never considered. TOEFL or IELTS Score. Advanced proficiency in spoken and written English is essential for your success as a student and future English teacher. If you are an international student, the current requirement is a TOEFL score of 600 PBT, 250 CBT or 100 iBT, or an IELTS score of 6.5. If you don’t have the scores, ASU offers an excellent, multi-level English language program in the American English and Culture Program (AECP), where you can work on your English proficiency while preparing your application. Official Transcripts. Be sure that your overall GPA is 3.0 on a 4 point scale (i.e., B average) or above. It would help if you have taken courses related to applied linguistics, linguistics or language teaching, but it’s neither required nor necessary. Department of English Application. Fill it out completely and neatly. Type the form—hand-written applications can be a turn-off. Graduate Application (online). Be sure to complete both Department of English and Graduate Application. Best of luck with your application process! The 2008 Symposium is just around the corner. I'm really looking forward to reconnecting with many of the colleagues from around the world as we explore the issue of foreign language writing. In the meantime, I'm already working on the next one--to be held at Arizona State University on November 5-7, 2009. The theme of the 2009 Symposium will be "The Future of Second Language Writing," and the call for proposals will be available sometime this fall. I hope you will join us in exploring the future directions for this young and vibrant field. I've been too busy to even keep track of my own work. Here are a few publications that recently came out. As the title suggests, this chapter provides an overview of the development of first-year composition--starting with the creation of the first-year composition course in the late 19th century. It also considers the rise of rhetoric and composition as a discipline in the mid 20th century and explores some of the major pedagogical approaches in the 20th century. Abby, by the way, is going to start as Assistant Professor at Kansas State University. This piece examines one of the extreme positions I've seen people take--that ESL writing courses (intensive or first-year) are for international students only and that resident students' needs are too different from international students for them to be placed in the same course. Well, it may be, but given the demographics, all writing teachers--mainstream, basic, or ESL--need to be prepared to work with students who come from various language backgrounds. Matsuda, P. K. (2008). Voice in second language writing: Implications for Japanese learners of English. JACET Summer Seminar Proceedings, No.7: Issues in L2 Writing Instruction (pp. 9-14). Tokyo: The Japan Association of College English Teachers. This is an outcome of a JACET summer seminar in Kusatsu, Gunma, Japan. (If you are in Japan in August, I highly recommend it.) Based on my earlier study of voice (Matsuda, 2001), I considered the implications of voice for English learners in Japan. While my view on voice encompasses both individual and social voice, I couldn't help but notice that many Japanese students want to develop their own individual voice. That is, they don't want to stand out but they don't want to be the same as everyone else. Individual identiy, after all, is something we create by combining socially available discursive and non-discursive repertoire. This is a response to the response that Paul Stapleton and Rena Helms-Park wrote to our article on voice (Matsuda & Tardy, 2007). It may sound pretty strong, but we felt compelled to respond to all the points that Stapleton and Helms-Park raised in their piece. (I've met them both, and they are great people.) Chris and I have a follow-up article on voice (though not in response to this dialogue) that's being considered for publication as we speak. Steve and I wrote this piece during the summer of 2006. I thought of this as a culminating experience for our mentoring relationship at UNH and an important step toward our relationship as colleagues. It was useful for me to reflect on my approach to mentoring and to hear Steve's perspective as well. I was also happy that we were able to receive responses from some of my other mentees, including Michelle Cox, Joleen Hanson, Matt Schneider, and Christina Ortmeier-Hooper. Matt Schneider, who came from San Francisco State to work with me during the summer, observed the whole process of writing this piece. I was lucky to have had the chance to work with these and many other great grad students at UNH, who remain my important colleagues and friends. A list of major publications is available at: http://matsuda.jslw.org/publications.html. I've written on the topic of requesting a recommendation letter, but what about asking someone to be a reference (i.e., listing that person on your CV or resume)? Of course it depends on the situation, but the same general principles of requesting a recommendation letter also apply. Don't assume that the person can (or is willing to) serve as your reference. Ask for their permission to have their names included--before you include the name on your resume or CV. Ask for the preferred contact information. Some people may wish to receive those phone calls at home while others may not like to be bothered at home. Others may prefer email over phone. Provide some information about the job. Who is the employer? What's the nature of the job? (Summer job? Permanent job? Internship?) Is there a job description? In what ways do you think you qualify for the job? Provide the timelines. When is the application deadline? When will they be scheduling the interviews? When does the job start? This type of information will help your prospective reference to anticipate when they might receive the call. It would help if you could provide the documents that you would normally provide when you ask for a recommendation letter. You would want the person to say that you are well organized and considerate, and has strong communication skills (among many other things). If so, it would help if you could demonstrate those skills when you make the request. The 2009 conference of the American Association for Applied Linguistics (AAAL) will be held March 21-24 at the Denver Marriott Tech Center, Denver, CO. The abstract submission deadline is August 15, 2008. The early registration deadline date is February 20, 2009. Symposium on Second Language Writing, West Lafayette, IN, June 5-7, 2008. Thomas Watson Conference, University of Louisville, Louiville, KY, October 16-18, 2008. National Council of Teachers of English, San Antonio, TX, November 20-23, 2008. Conference on College Composition and Communication, San Francisco, CA, March 11-14, 2009. American Association for Applied Linguistics, Denver, CO, March 21-24, 2009. Teachers of English to Speakers of Other Languages, Denver, CO, March 25-28, 2009. Symposium on Second Language Writing, Arizona State University, Tempe, AZ, November 5-7, 2009.